An economic powerhouse and home to the Nagano Prefectural Government Office, Nagano City is also a prime destination for hot spring fans, boasting many hot springs that visitors can go to on day trips. The city is home to the Joshin’etsu Highland National Park that served as an Olympic venue where even beginners can enjoy skiing and snowboarding, and more traditional cultural sites such as Zenko-ji temple and Togakushi shrine. The food is also exceptional, with the delicious Shinshu soba and oyaki being the local specialties. Venture beyond the inner chamber of this pilgrimage site, down a narrow flight of steps to a completely dark corridor. Visitors who manage to touch a metal key hanging on the wall here are said to gain enlightenment. Because the temple is non-denominational, many have travelled here over the years to be saved regardless of religion, gender, or station, driving the temple’s ongoing popularity. 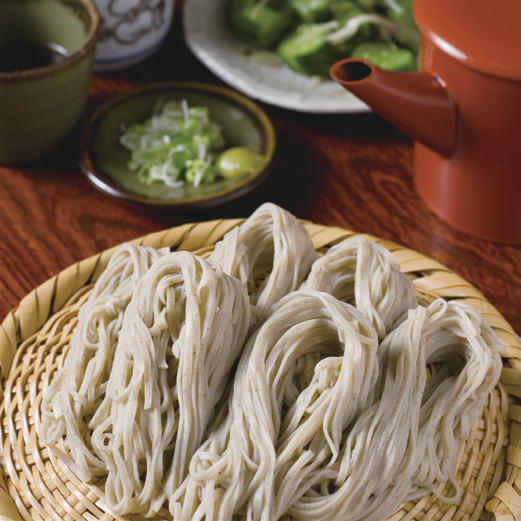 The climate of Togakushi gives birth to a tasty soba noodle with a strong aroma known as Kirishita Soba. Traditional soba making techniques combine with clear water to create a strong noodle. The soba is harvested each year in summer and autumn; the fresh soba of autumn known as ‘new soba’ and available from late October. 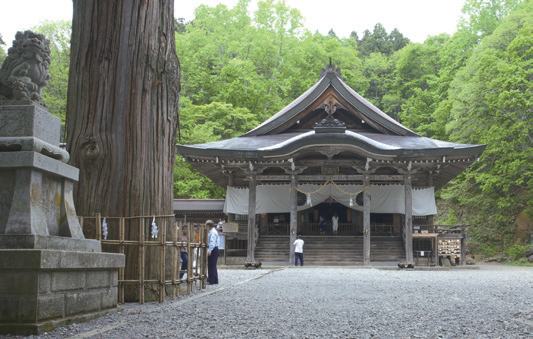 This shrine is located at the base of Mt. 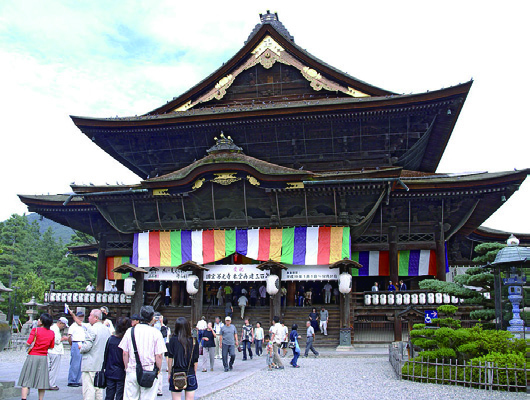 Togakushi, a widely visited holy mountain 1904m in height long known as a pilgrimage site for those of faith or seeking enlightenment. Today, it is a holy spot and a power spot where visitors can feel the earth’s energy, drawing visitors from across the country to pray for strong harvests, good fortune, and good health. A hidden hot spring at the heart of Matsukawa Gorge in the Shinshu Takayama Onsen- kyo. Three hot spring resorts call the area home, and day visitors are welcome. 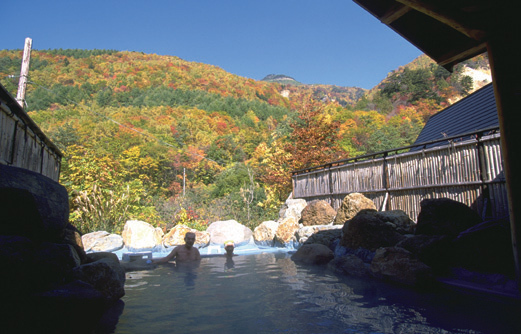 The autumn foliage is some of the best in the entire region, and the hot springs are the perfect place to relax. The region’s name comes from the seven different springs in the area. 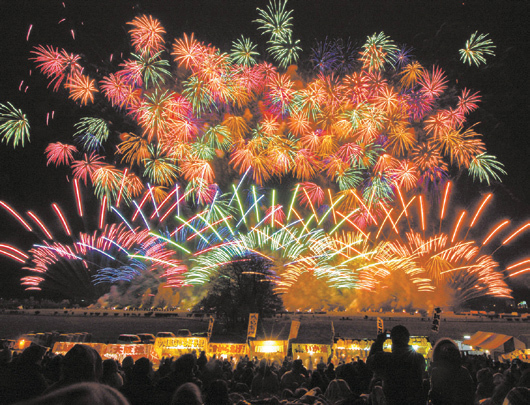 This fireworks festival is a symbol of the coming of winter to Nagano City. In addition to splendid fireworks displays, giant 24-inch shells light up the autumn sky in internationally- acclaimed displays. A beautiful lake 1,200m above sea level with a mirror- like surface that reflects the landscape year round, from the new shoots of spring to the cool breezes of summer and the autumn foliage. For the best view, plan a visit in the morning. 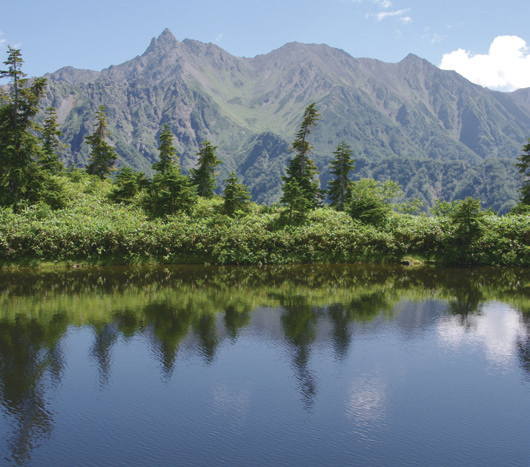 The lake is lined by a walking track, and the Togakushi Mountain Botanical Gardens is close by as well.